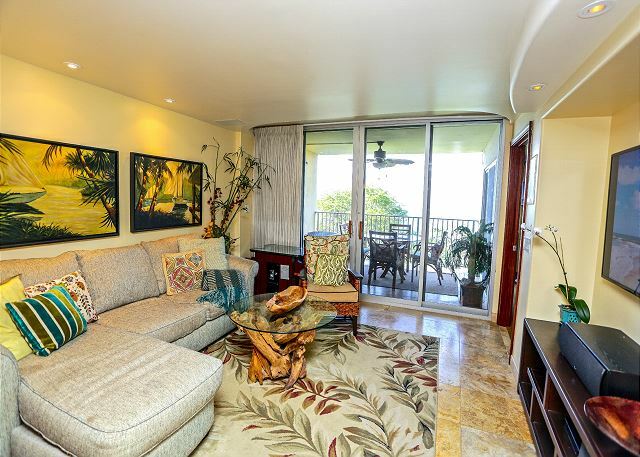 Come relax in this beautiful two bedroom, two bathroom unit with its hand-crafted wood furnishings, incredible views and oversized lanai looking out over the ocean. 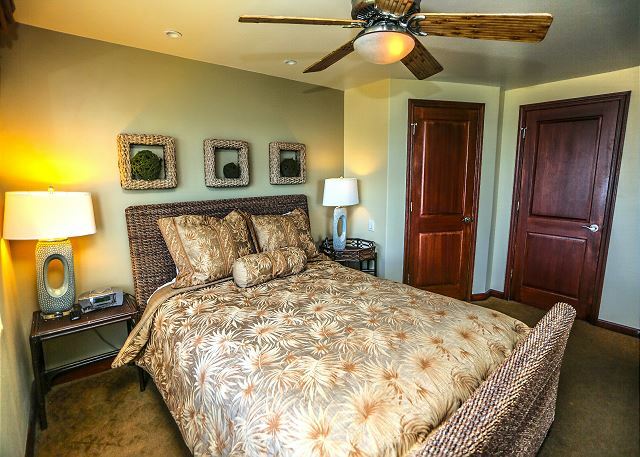 The master bedroom has its own entrance to the lanai. 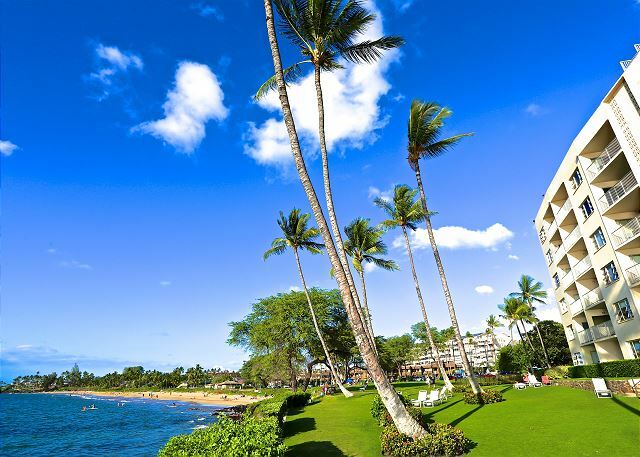 Your perfect vacation awaits! 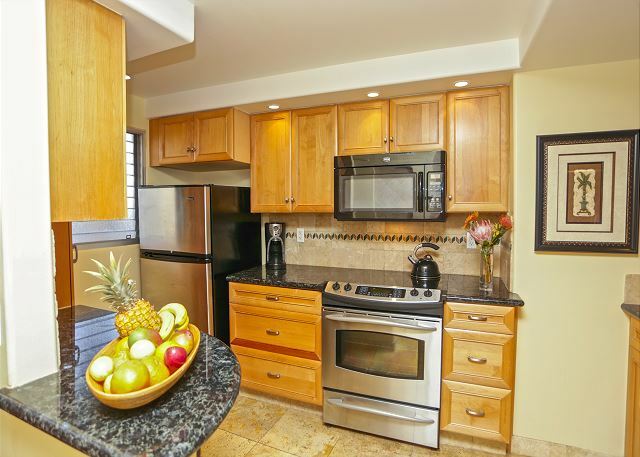 This gorgeous unit is located at the beachfront property of Royal Mauian. Take a walk on the sand or lounge by the pool with your favorite book. 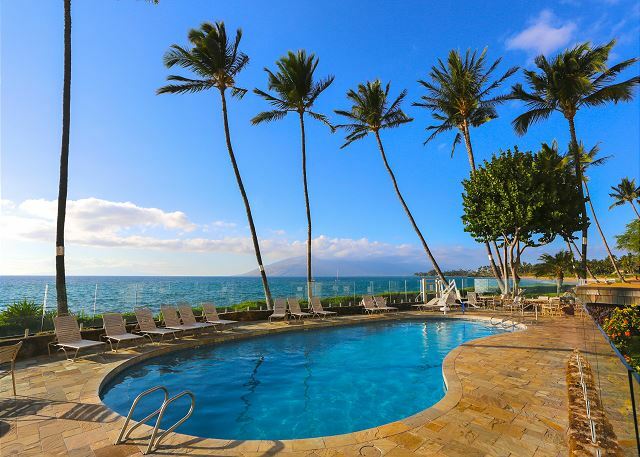 This complex has something for everybody; upscale amenities, a relaxing atmosphere and a prime location right in the heart of Kihei. 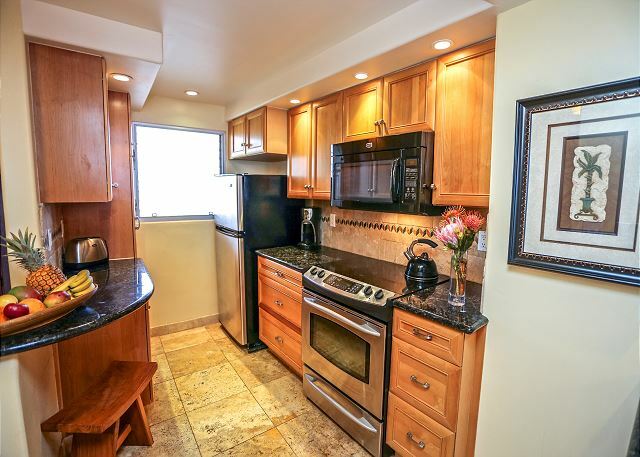 Several great restaurants and shops are within walking distance as well as a surf school! 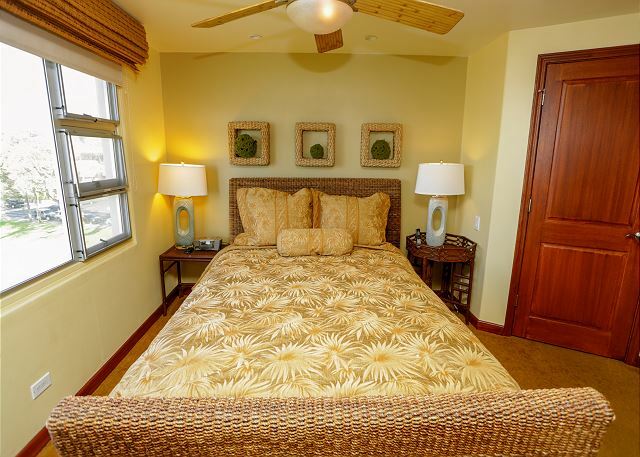 The large lanai comes equipped with outdoor furniture as well as an outdoor ceiling fan to keep you cool throughout your stay. 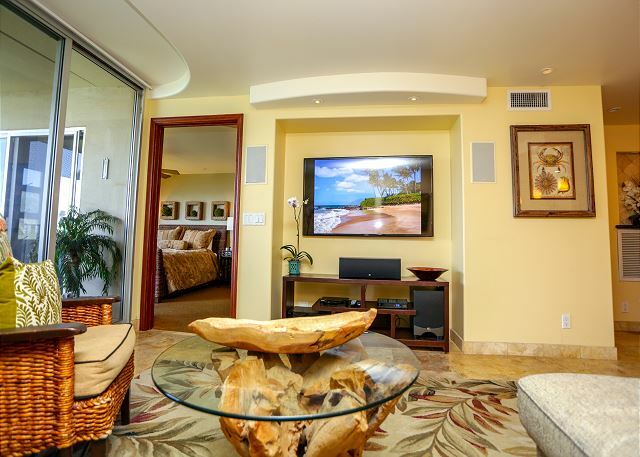 This oversized, private lanai may be accessed from the living room or master bedroom for endless ocean views! 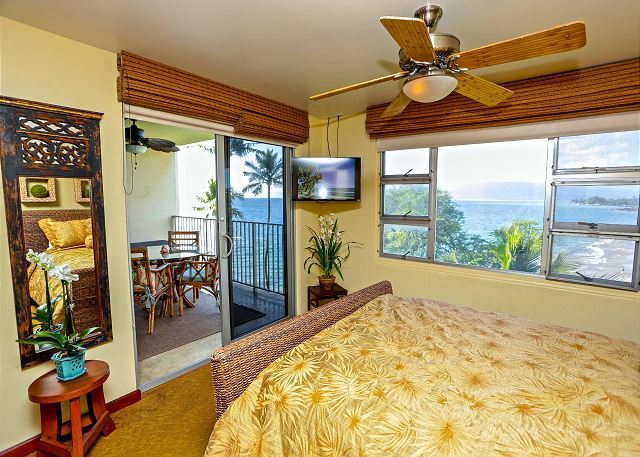 The window from the master bedroom reveals panoramic views of the gently rolling waves and immaculate sunsets! 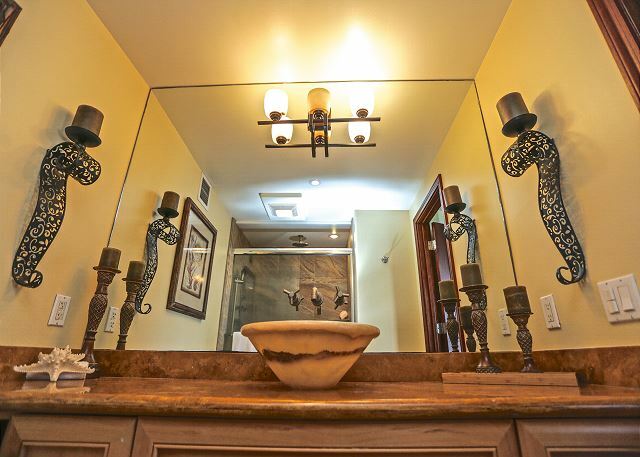 The master bedroom also features a queen bed and its own gorgeous en suite bathroom with a circular vessel sink, a large glass shower with a detachable shower head and updated furnishings. 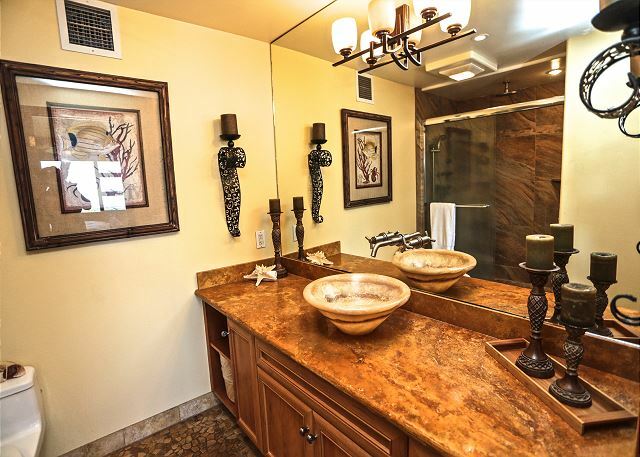 Additional surrounding jets make for a truly luxurious shower experience. 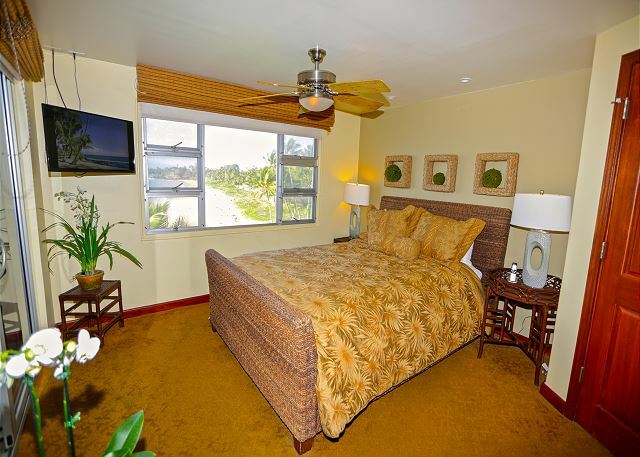 The second plush bedroom includes two twin beds, a ceiling fan, ample closet space, a large flatscreen TV and it's own tiled guest bathroom. Central air conditioning, tasteful furnishings, a flatscreen TV and a comfortable L shaped sleeper sofa make this unit homey and luxe. 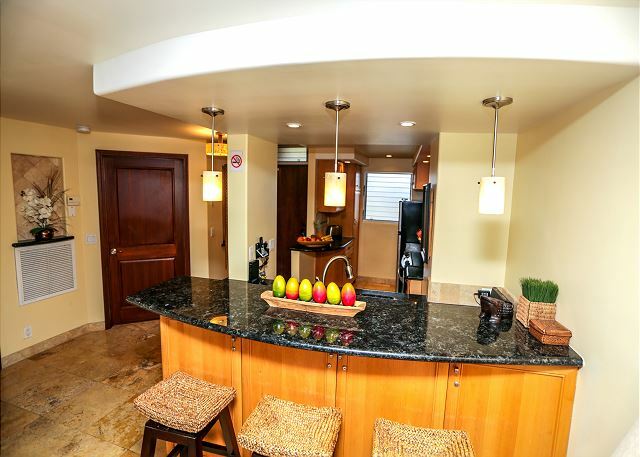 Enjoy your favorite meals in this fully equipped, open and spacious kitchen. 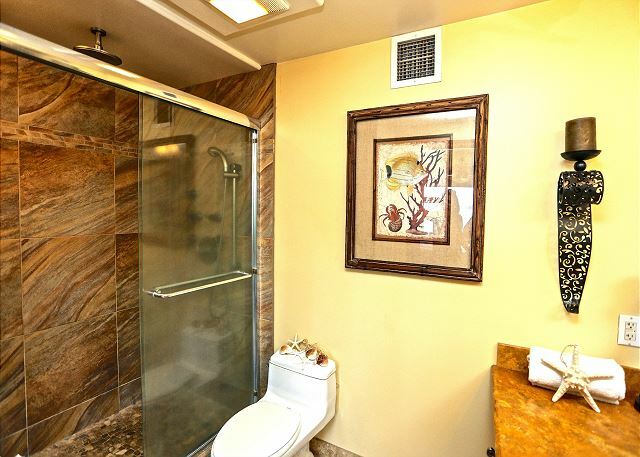 It includes beautiful tile floors, stainless steel appliances and granite countertops. 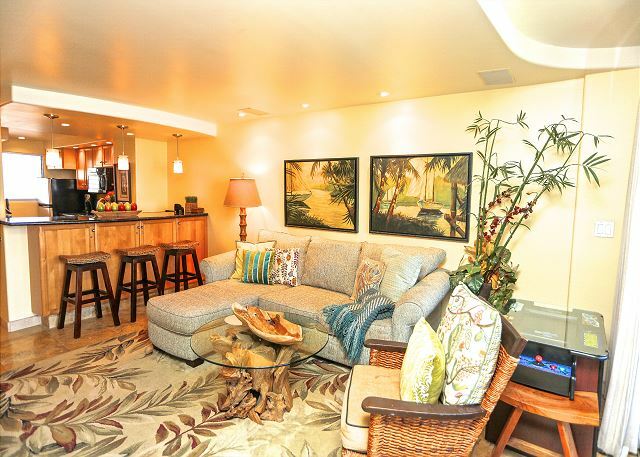 Entertain your guests as they relax along the bar seating for three. Discover a new book from the library on the second floor or enjoy complimentary coffee and tea alongside the heated freshwater pool. Venture up to the rooftop garden and enjoy the BBQ's (available for your use), and the breathtaking ocean views. You will not be disappointed! 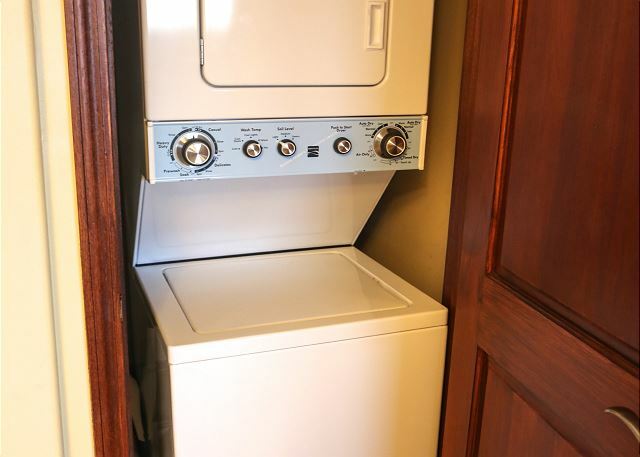 UNIT AMENITIES: Smoke Free environment, AC, Free WiFi, Fully Equipped Kitchen (Cooking range/oven, Refrigerator, Dishwasher, Microwave, Blender, Coffee maker, Dishes & silverware) Cable television, DVD/CD player, Ceiling fan, Private lanai, Iron and ironing board, Additional linens and towels, Complimentary starter kit of laundry detergent, shampoo, soap etc. Hair dryer, Beach gear (beach chairs, beach towels, a cooler and a beach umbrella) Free parking. We are always available to be reached via email or phone. We have a cleaning team on call; additional cleaning could be arranged for a fee. 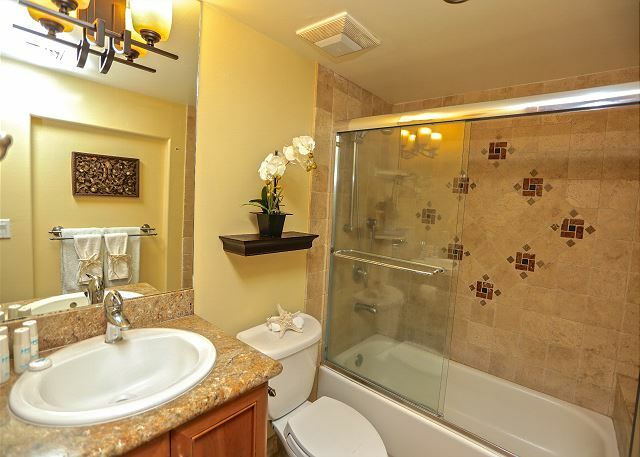 Generally our long stay guests take advantage of this service. Our Maintenance team is on call and can assist at any time. Check-in and Check-out are very simple. 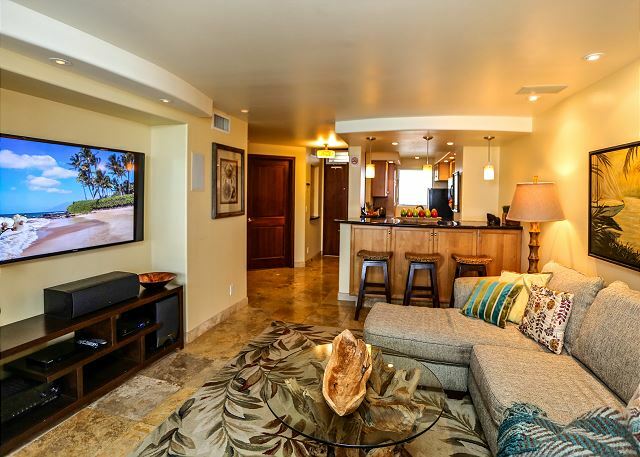 We send you a pre-arrival email that has all necessary information on how to get to the condo, what the electronic door lock code is, pool access code, etc. We recommend you print the email prior to the trip or saving it on your smart phone to easily access it when you arrive at the complex. A private Concierge is always standing by to help with any activity bookings, island recommendations and restaurant reservations. 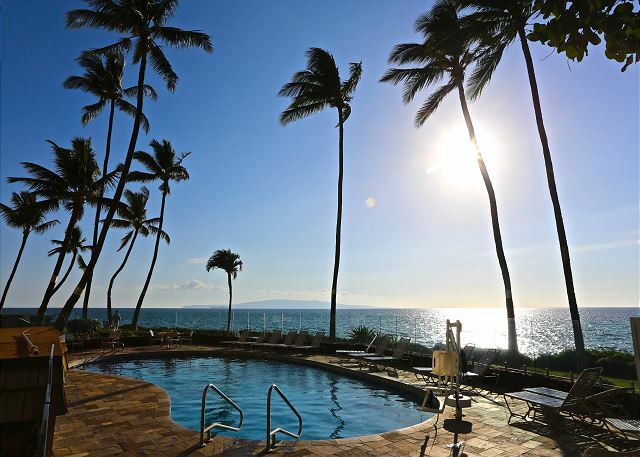 The Royal Mauian is located on Maui’s most pristine beaches, Kamaole I and II. 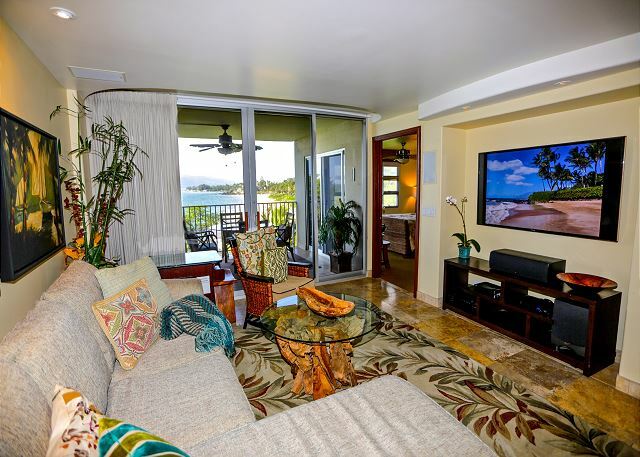 Just steps from the complex you will find restaurants, shopping, health food stores, snorkel rentals and a surf school. Maui’s unique and varied terrain offers a multitude of activities. From relaxing on some of the world’s most beautiful white sand beaches to the more adventurous undertakings of zip-lining and paragliding. 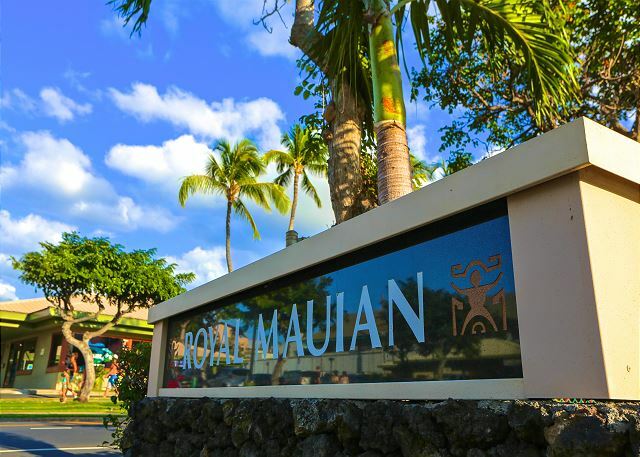 The Royal Mauian's location is such that there are many activities and attractions right at your finger tips. 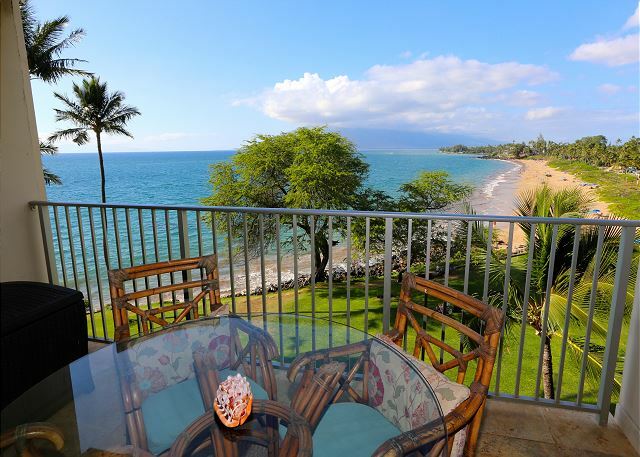 Some of Maui’s top attractions are: Maalaea Harbor; many boats leave from Maalaea on snorkeling trips, deep sea fishing, scuba diving, whale watching (in season), sunset cruises, and more. 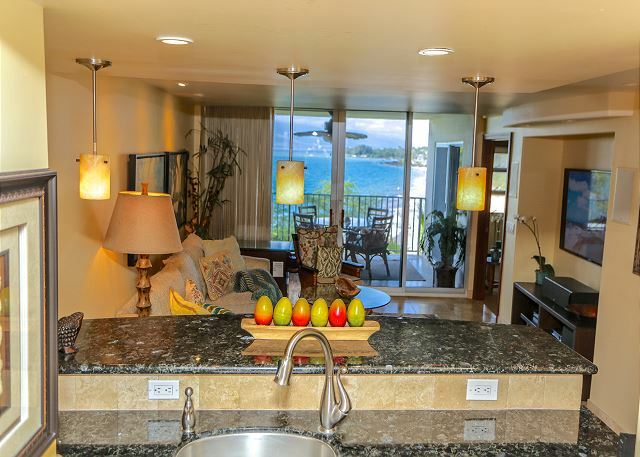 Rooms Sleeps 5, Your fifth floor oceanview bliss awaits in one of Royal Mauian's most requested units. 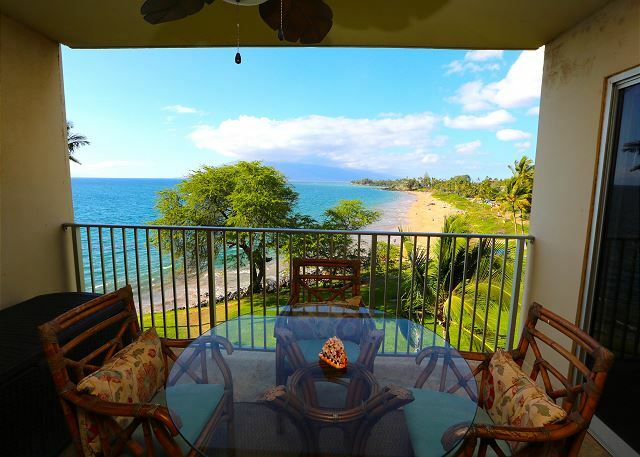 Enjoy the elegant two bedroom, two bathroom unit with its beautiful wood furnishings, incredible views and oversized lanai looking out over the glittering Pacific Ocean.